Grave of Vítězslava Kaprálová in Brno’s central cemetery. Every nation and every culture has given birth to prodigies with seemingly natural talents for one professional endeavour or another. As far as Czechs are concerned, Vítěslava Kaprálová (1915-1940) most certainly stands out as a musical prodigy. She composed her first piece for piano at age nine and made her debut as a professional conductor at 20. Between that professional debut and her death five years later, Vítězslava Kaprálová conducted orchestras both at home and abroad and distinguished herself as one of the most important Czech female musical figures of the 20th century through her compositional as well as conducting skills. 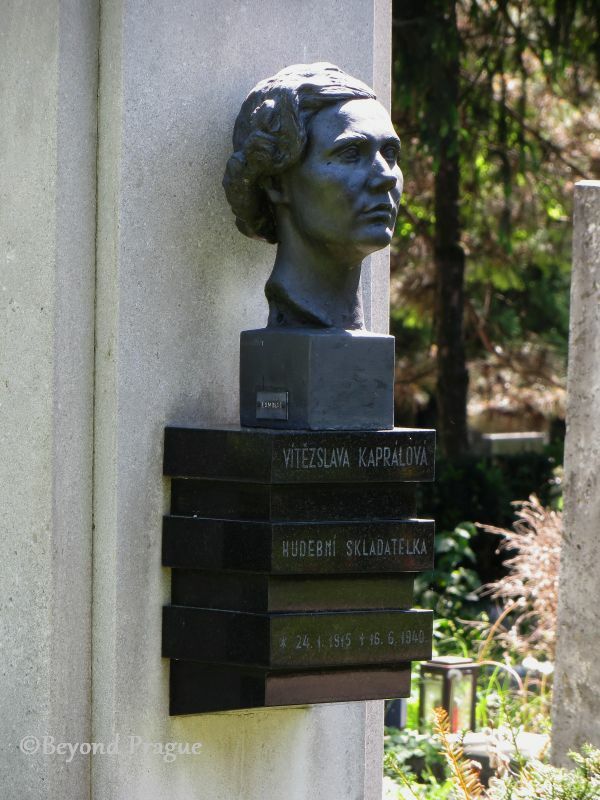 Vítězslava Kaprálová is, as are many of her contemporaries of the interwar period, considered part of the Neoclassicism movement of music inspired by the likes of Igor Stravinsky. Though her life was cut tragically short, she was very productive in the time she was given and her legacy is kept alive today in spite of her name nearly disappearing from history in the latter part of the 20th century. While Vítězslava’s status as a prodigy is undeniable, even the most talented of prodigies need to be in the presence of those who can see the talent within them and take an interest in developing it. Vítězslava was born in Brno and had the good fortune to have musical parents; her father was composer Vacláv Kaprál (1889-1947) while her mother, Viktorie (1890-1973) was a singer and qualified voice teacher. The Kapráls were well established on the musical landscape of the still newly emergent Czechoslovakia and had connections with many more musical luminaries at home and abroad. Young Vítězslava most certainly did not lack for qualified individuals to inspire her and help sharpen her own natural talents. While her parents encouraged and supported her interest in music, they discouraged her from persuing it professionally as they hoped she might take over the running of their music school one day. Despite her parents’ hopes, Vítězslava decided very early on that music at the professional level was her calling. It can’t be stressed enough the importance of her geographic location and how it connects to her success. The “First Republic” period of Czech history marked the emergence of an independent Czechoslovak nation unfettered by outside rule and eagerly reaching out to connect with the rest of the world. As it was also a country with a burgeoning arts scene, many from outside were also reaching out to it. By 1930, at the young age of 15, Vítězslava was enrolled at the Brno Conservatory and studying a double major in composition and conducting. The five years she spent there were marked by high compositional productivity and a very well recieved graduation concert. In 1935 she became the first female graduate of the Brno Conservatory’s program. in late 1935, she was accepted into the highly competitive Master School of the Prague Conservatory to continue her double major studies and studied under the best instructors her homeland had to offer. She studied composition under Vítěslav Novák (1870-1949), himself a pupil of the legendary Antonín Dvořák, and conducting under Václav Talich (1883-1961) who was a chief conductor of the Czech Philharmonic and the National Theatre at the time. Some of her best known music was composed during her time studying in Prague. It was her graduation piece, Military Sinfonietta, which was played by the Czech Philharmonic with her as conductor in 1937 that brought Vítězslava to the attention of wider audiences both at home and abroad. The following year, she premiered the piece in Great Britain at the annual International Society for Contemporary Music (ISCM) Festival in London. She conducted the BBC Orchestra in playing it and was generally well received by both the festival jury and audiences. The London performance also garnered her attention in America as it had been transmitted across the Atlantic and broadcast there. Following her studies in Prague, Vítězslava spent two separate periods studying and working in Paris between Autumn of 1937 and Spring of 1940. During her time in Paris, she studied conducting under Charles Munch and had intended to study composition with Nadia Boulanger. While she was able to communicate with Munch in German, Vítězslava’s command of French was inadequate for her to work with Boulanger. As such, she put the bulk of her efforts towards conducting. Another angle on Vítězslava’s grave in Brno’s central cemetery. Vítězslava Kaprálová was as gifted in her social skills as she was in music and many were charmed by her personal charisma and energy. One person particularly taken with Vítězslava was fellow Czech composer, Bohuslav Martinů. Well established in both Czech and French musical circles, Martinů was instrumental in facilitating Vítězslava’s relocation to Paris, her continuing education there and indroducing her to his many contacts in the Parisian contemporary music community. Initially, the relationship between Martinů and Vítězslava was that of mentor and student with Martinů tutoring her in composition. Their relationship quickly moved from professional to personal and they became lovers in spite of Martinů’s existing marriage. Martinů was absolutely obsessed with Vítězslava and was very generous to her with both his time and resources. He expressed to her an intent to divorce his wife, Charlotte, and take Vítězslava with him to America. While he and Vítězslava laid some plans for their transatlantic relocation, the signing of the Munich Agreement and the subsequent occupation of Czechoslovakia by German troops destroyed any chance of their plan’s success. Shortly after the German army marched on Czechoslovakia, president Edvard Beneš established Czech governments in exile in both France and Great Britain. Free Czech troops were assembled and formed into regiments of the French army; failing to gain acceptance into military service, Martinů showed his support for the Czech military volunteers by composing a musical piece in their honour in 1939. This act made Martinů a marked man to the Nazis and force him to flee Paris and eventually Europe entirely. He fled with his wife and left Vítězslava largely to fend for herself in Paris. Still stunned and reeling from seeing German troops occupy her homeland in late 1939, Vítězslava found herself in the French capital completely reliant on the generosity of friends and other benefactors, including Edvard Beneš. With consistant employment difficult for her to find and Bohuslav Martinů effectively gone from her life, Vítězslava had no choice but to move in with a group of friends to pool resources. One of those friends, and Vítězslava’s future husband, was Jiří Mucha; the son of famed Art Nouveau painter, Alfons Mucha. Jiří and Vítězslava were married in April of 1940 and shortly after she started showing signs of serious illness. With German forces advancing towards Paris, Jiří took Vítězslava to Montpellier in the south of the country. However, her condition rapidly deteriorated and she died in June. The cause of her death has always been a matter of conjecture and debate. Officially, the cause of her death was recorded as tuberculosis. However, many have stated that typhoid was a more likely cause. Though Vítězslava was buried in France in 1940, her remains were repatriated to her homeland and reintered in the central cemetery of her birthplace, Brno, in 1946. Though her life was cut tragically short, Vítězslava Kaprálová left the world with no fewer than fifty finished pieces of work for both instrumental and vocal arrangements. Her contributions to Czech music were recognised in 1946, when she was posthumously awarded membership in the Czech Academy of Science and the Arts, the most prestigious academic institution in the country. She became one of only ten women in the institution’s membership at the time and the only female musician. For many years after her death, interest in Vítězslava’s music diminished. It would not be until the 1990s when interest in her work was renewed. Much thanks for this must go to the establishment of the Canadian based Kaprálová Society, an organisation dedicated not only to the preservation of Vítězslava’s life and work, but also to the furthering of women in music. In 2015, she was commemorated on a postage stamp issued by Czech Post. 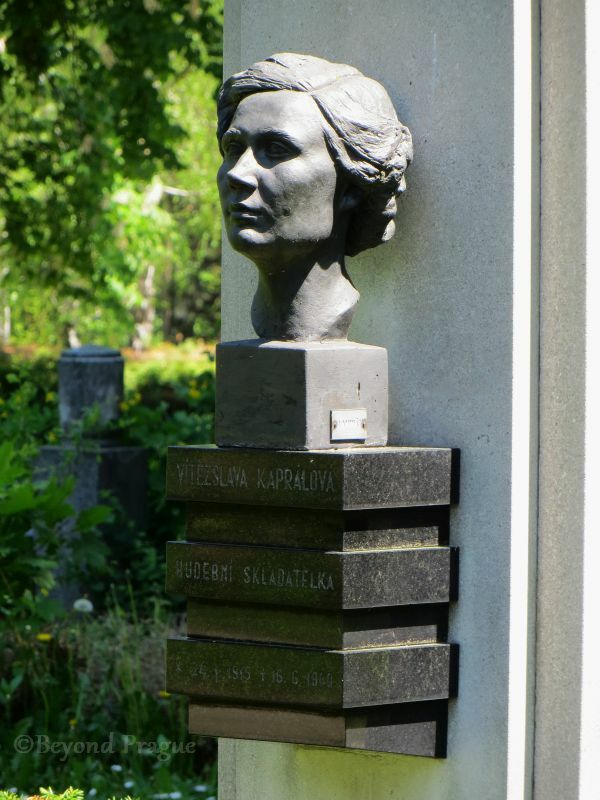 To learn more about Vítězslava Kaprálová, her life and work; the web site of the Kaprálová Society is a tremendous resource that contains not only a detailed biography of her, but also a list of her work and bibliography of printed works about her.